Funerals and protest marches are set to take place Sunday noon, mourning four Copts who died in sectarian clashes between Muslims and Christians in the town of Al-Khosous in Qaloubia governorate north of Cairo early Saturday. Four Christians and one Muslim were killed, in addition to eight others injured, in the violence, Egypt’s health ministry reported. A Coptic priest, however, told the private CBC satellite channel Sunday that six Copts had died in addition to many more injured. While several marches are reported planned, the main march will set off from Saint Mark’s Cathedral in Abbaseya, Cairo, at noon, following Sunday mass prayers. The deadly clashes that erupted in Qaloubia Saturday between groups of Muslim and Christian teenagers followed the latter allegedly painting offensive drawings on the gates of an Al-Azhar institution in the town, MENA news agency reported. The situation further escalated when someone drew a gun and fired into the air, killing one boy with a stray bullet, Reuters reported. In the aftermath of the violence, 15 people were arrested and the town tightly controlled by police forces. 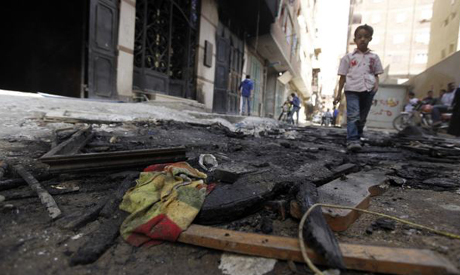 Shops belonging to Christians were reportedly smashed by angry protesters. Reuters stated that some Christian and Muslim properties were burnt out. The violent attacks have sparked widespread condemnation by rights groups and politicians. Al-Azhar’s Grand Imam Ahmed Al-Tayeb urged measures to prevent the situation from escalating and to "preserve the national character that characterises the Egyptian people, Muslims and Christians," MENA state news agency reported. The ruling Freedom and Justice Party (FJP) said Saturday in a statement that "The party is [sorry] for the victims of these unfortunate clashes regardless of their religion — Muslims or Christians.” It called on authorities to "reveal the plans [aimed at creating strife between different Egyptian sects], punish those behind them and stop this threat." What foreign conspiracy? What I saw was the Egyptian government represented by the police siding with a section of civilians to lay seige to a church and its mourners. The Egyptian government cannot continue to blame "foreign fingers" for any thing wrong in Egypt they need to accept they as the protectors of Egypt and all its people are to blame.